For older adults, staying active and finding fulfilling hobbies to pass the time are important and beneficial to their physical and mental health. After all, no one wants to spend their golden years feeling bored and unfit. But as people age, a number of ailments like arthritis, osteoporosis or heart conditions can make it more challenging to stay active and get exercise. Seniors need to find hobbies that can help keep them fit and mentally stimulated without putting too much strain on their bodies. Fortunately, now is the perfect time of year for older adults to participate in such an activity: gardening. Properly maintaining a garden takes effort and dedication, which makes it a great project to take on for people looking to feel engaged in their downtime. It can give your older loved one something to work at and be proud of - it keeps their minds active which is good for their moods and maintaining their cognitive functions. Psychology Today reports that the nurturing aspects of gardening can boost people's self esteem. "The nurturing aspects of gardening can boost people's self esteem." There are numerous benefits to connecting with nature, which gardening allows people to do. It doesn't matter if you live on a wide stretch of land in the country, have a modest yard in the suburbs or use container gardening techniques to grow plants on your balcony in a big city - the act of gardening and working with living greenery can provide that connection for your loved one. A Stanford University study published by the Proceedings of the National Academy of Science found that exposure to nature for as little as 90 minutes can reduce depression and improve overall mental wellbeing. Gardening also promotes relaxation and releases chemicals in the brain that combat stress, according to Psychology Today. While it can instill a sense of responsibility that can help give your loved one purpose, it often requires rhythmic, patterned work that doesn't require too much focus or stressful problem-solving. The health benefits of gardening are not all mental, however. Gardening is a great low-impact way for older adults to achieve much-needed physical activity that is good for muscle growth and heart health. The Centers for Disease Control and Prevention lists gardening as a recommended strengthening exercise for people over the age of 65. They recommend that adults in this age bracket participate in muscle-strength activities at least two days a week, in conjunction with aerobic activities like walking or biking, to help prevent age-related health problems, such as diabetes, hypertension, stroke and cancer. Planting a garden and maintaining it through weeding, fertilizing, pruning and watering requires people to dig, hoe and lift, which are all ways to engage muscles groups across the body. Gardening also requires bending, twisting and walking around, which can work their bodies and provide some of the necessary aerobic activity for a balanced workout routine. 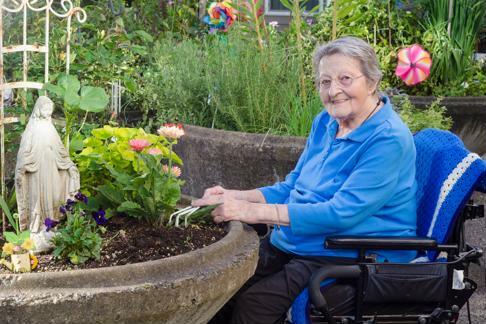 Regularly tending to a garden can help older adults connect with nature to reduce stress. Though gardening may generally be a low-impact activity, it's important that your loved one still takes the time to participate in a prepared and safe way. They should do light stretching and warm-ups before they go out and start moving around in the garden. Otherwise, the repetitive motions of key gardening tasks could cause them to pull a muscle or strain their ligaments. The CDC says that if your loved one has been inactive for some time, they should start with just a few minutes of physical activity each day and slowly increase the time spent in the garden and the intensity of their activities. 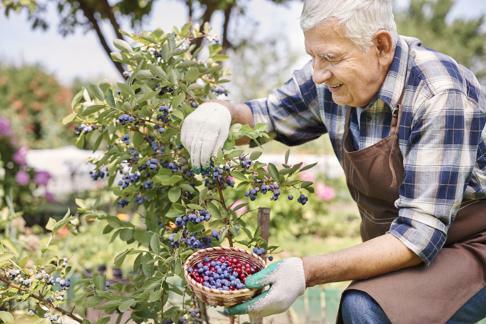 Older adults may also need to modify some ways that they work in the garden. If they have arthritis, for example, the CDC recommends that they use tools that are easier to grasp. Sitting on a small stool or kneeling on a cushion will be easier on the joints than crouching or resting their knees directly on the ground. The DIY Network also suggests using raised garden beds or vertical planters to help make gardening easier on the body. These practices eliminate the need for deep bending and squatting that can be harder on some older bodies. There are other potential risks to gardening beyond the physical limitations. Your loved one should dress appropriately when going outside. Wide-brimmed hats and sunscreen are imperative when spending time out in the sun, even on cloudy days. They should wear light clothing to prevent heat stroke and drink plenty of water to avoid dehydration. Mosquito netting and bug sprays should also be used to prevent bloodborne illnesses like Zika or West Nile virus. Raised flower beds can make it easier for adults with decreased mobility to work in a garden. With spring kicked in to high gear and summer on its way, now is a great time to start gardens that can produce herbs, vegetables and flowers into autumn. Be sure to help your loved one look for plants that are made to survive in your location - the National Gardening Association has a handy map that lets you see which products will have the most success for your climate. Pick out a few perennials that will return year after year without needing to be replanted each season, such as irises or tulips, and add in annuals like begonias this spring or marigolds the next to mix in some variety. Plant vegetables that you can use together to prepare your favorite meals for affordable, healthy summer dinners. Whatever your loved one decides to plant and tend to, just be sure they have the rights tools for success and their safety in mind so they can enjoy a rewarding hobby all season long.